In a short time, the Diotima Quartet has distinguished itself as one of the most outstanding interpreters of the contemporary string-quartet repertoire. They’ll play the very first string quartet 'Come fiume incessante' by Annelies Van Parys at November Music. The project's starting point is a movement we all share: breathing. Through dance, installation art and electronic music we hope to move from an I to a we, from individual to community. By collecting a multitude of unique breaths the project seeks to create a space where the visitors become conscious of their own breathing habits, and thereby contribute to greater freedom of action, individually and collectively. 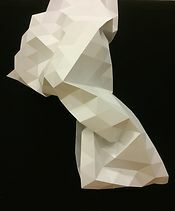 FOLDING stems from a research project on traditional origami techniques and contemporary 3D modeling software and explores the borderline between representation and abstraction. 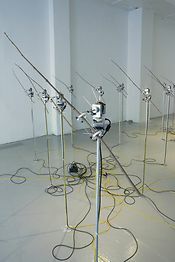 The aim is to accumulate a series of full scale kinetic sculptures based on 3D scans of the exhibition visitors. The sculptures expand and shrink according to motion patterns of the public in the space. Thus the visitors are reanimating the abstracted models of earlier visitors and create a responsive choir of breathing avatars. A metaphor for the blurring boundaries between animate nature and inanimate simulation and modeling technology. COSMOS.The quest for the origins of life in the universe has inspired many artists. Project Daejeon 2016 has an ambition to break with the stereotypical view of the world and humanity and wishes to give a deeper insight into art and science through various collaborations. The 50 twigs in SPACEJUNK point in unison in the direction of the oldest piece of human made space debris currently above the horizon. The debris being tracked are spent rocket bodies, parts from defunct satellites and wayward tools launched in missions as far back as 1958. 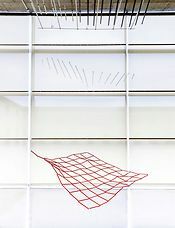 When the piece of debris being tracked drops below the installation’s horizon the twigs go to a rested downward pointing position and await the next debris to appear.